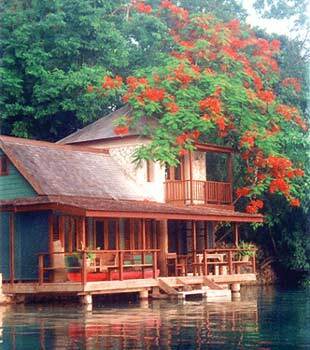 Goldeneye, a secluded resort in Jamaica, is an ideal spot for first-class travel to the Caribbean. Hideaways Staff Writer, Julie Matthews, and her husband discovered this intimate resort built by 007 creator, Ian Fleming. You don't have to be a world spy to figure out that a stay here is luxury travel at its best. Accommodations include five romantic and comfortable villas with outdoor showers and canopy beds ideally situated for soaking in fabulous ocean views. One of the highlights is the opportunity to tour Fleming's original house, located on-site, where you can see where he wrote 14 of his famous 007 novels. Whether you're on your honeymoon, or just a romantic vacation, strolling around the candle-illuminated property at night will put you in the mood, especially after a signature cocktail at the resort's outstanding restaurant.